Read “Poetry of the Earth” Bengali meaning, text for Higher Secondary English exam preparation. West Bengal Higher Secondary English Preparation for H.S. Exam. I try to clear about the well known poem “The Poetry of the Earth” in Bengali. So I write The poetry of earth’s word notes and line by line Bengali text which will help you to better understand. Textual grammar of the poem ‘Asleep in the Valley’ for Higher Secondary exam preparation. Bengali meaning and words notes of the poem ‘Asleep in the Valley’ for Higher Secondary exam preparation. 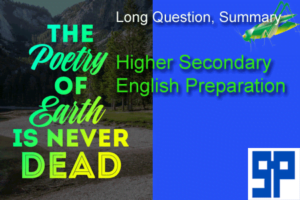 Long Question Answer of the poem ‘Asleep in the Valley’ for Higher Secondary exam preparation. Other Prose – Poem – Drama Questions – Answers for Higher Secondary exam preparation.